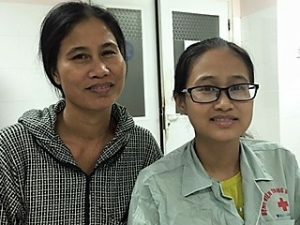 The MEDRIX Team recently received this touching letter from a recent heart surgery recipient, Ma Thi Thuy Hang, an 18 year old medical student. We want to share her inspiring story with our donors and supporters to let them know the enormous impact they’ve had on Ms. Hang’s life. My name is Ma Thi Thuy Hang. I am 18 years old. I am a student of Hue University of Medicine and Pharmacy. First of all, I would like to send to all of you – the members of MEDRIX, my best wishes for Good health. On November 10th, 2016, The Cardiology Center of Hue Central Hospital have received the donation from Charity organizations for supporting a part of surgery cost for the poor patients. I am the one of the patients who luckily was selected to receive the scholarship for surgery cost from MEDRIX organization. I am a child of the family that has 3 children. My parents are farmers and we live with [my] grandmother who is 80 years old. Due to the limited economic resource, when I was diagnosed with heart disease a year ago, I cannot afford the surgery cost. I just came to see the doctor periodically and took medicine. That time, I was very sad and discouraged and want to give up. Then the time passes by, the sadness was set beside and I gradually became more optimistic thanks to my parents, relatives, friends… I have tried my best to become [a] student of Hue University for Medicine and Pharmacy. And my dream came true! One month after studying at the university, I had to [be] hospitalized because of severe Mitral Valve and aortic valve failure and that time the doctor told us that I need to have surgery as soon as possible so that I can continue study in the medical field. My family was very surprised with the notification of the surgery cost of 85 million Vietnam Dong ($3800 USD). It was very very huge amount to our family. [After being] hospitalized for a certain time, I was scheduled for surgery on November 11. For other patients, they was happy and expecting the surgery, as they know after the surgery they can return to normal life and can do what they could not do in the past due to their health condition. But I was not. It normally takes 1 months, 2 months or longer time to have arrangement for surgery schedule. However, I was so worried for my family: how they can afford 85 million dong surgery cost on time for my surgery, if they did not have enough money to pay for the cost, my schedule for surgery would be cancel. I was supported from OGCDC but it nearly the deadline, and I did not receive the confirmation. Fortunately, by the day before the date of surgery, I received the scholarship from MEDRIX organization to make my heart surgery possible. Thanks to the donors of MEDRIX organization and Dr. Nhan organization of Hue University of Medicine and pharmacy, I had heart surgery as the schedule. I thank you so much for your great support. Moreover, before and after my surgery, I was encouraged by MEDRIX representative team who came to see me and have inspired me the strength to strive to the disease. Now after the surgery, I am feeling much better. I promise to try my best to become a good doctor and provide the best treatment for the poor patients. Thank you again for your great support and wish you all Good Health. Wish MEDRIX is more and more developed to help more people.